So much has happened the past few days. It's been filled with many events so to capture some tidbits of each event, I think some themes should be in place. For this theme... it's about the musical, the graduation, the parties....partyland Sam. 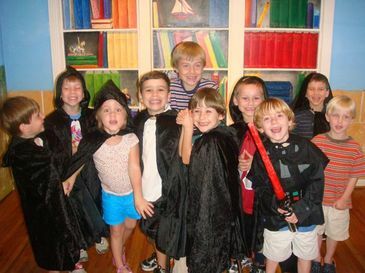 Day One: Thursday, Sam had his much anticipated Star Wars party. I'll have to say that Storyville Station in Birmingham is a great place to have a party. Sam and his jedi knight friends ate popcorn and cupcakes, fought Darth Vader, had a pod race, swished their light sabers,, danced around and trained as official jedi knights. And they also slid down a secret slide into the Jedi training room. However, before the party even began, we had some weather issues. A tornado warning was issued for our county and then a funnel cloud was spotted very close to where we were about to start the party. 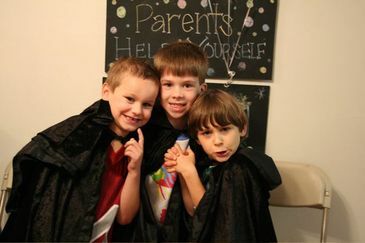 We pushed back the party and kids did make it and ran through pouring rain to this event. Some of these die hard Skywalker fans did not want to miss the party... no matter what! Some Jedi Knights in training. I think they are holding imaginary light sabers. From the buzzing of party land to school land. 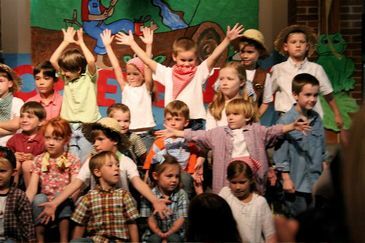 Day two: Friday, Sam's first musical- "Down by the Creekbank" and Kindergarten graduation. ( Sam on top row, arms raised, head turned with light green shirt). I have looked forward to this day just as much as Sam because my brother and I were in "Down by the Creekbank" many many years ago. So fun to watch Sam perform the same songs and bop around on stage. He smiled continually. How I love watching him. Do we, as parents, ever get tired watching our kids just be kids and enjoying the moment? Sam and Elijah ( Elijah is Sam's good friend, neighbor, and fellow Jedi Knight) As I was driving Sam and Elijah to school today, I asked them, "what do you want to be when you grow up?" Sam said, "I want to be Luke Skywalker. "( with emphasis on LUUKE) Elijah said, "I want to be Anakin but Anakin on the good side with a green light saber." Oh, the simpleness of six. 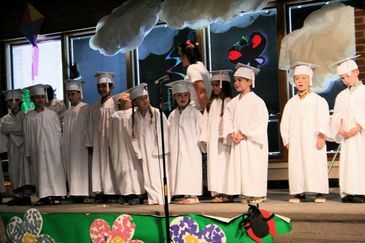 mini graduates.. sam on left end with arms crossed. 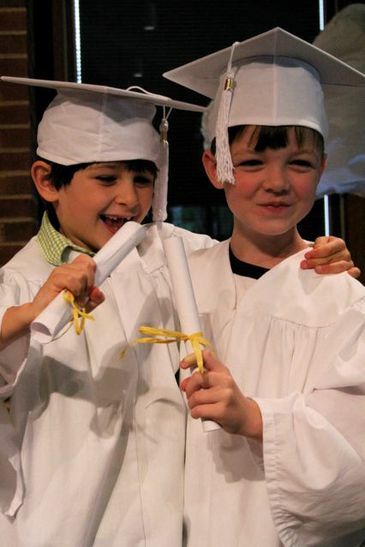 Graduation... a milestone.. a time of going from little kidness to big kidness. Am I ready for Sam to grow bigger and be older and say older things and do older things? I'll have to admit that I have some sadness that this part of life is over. I love his age and this stage of his life. Love watching him bounce around with his happy little self and sing songs and play with legos and shoot hoops. I love it that he still loves to cuddle and hug and will run up and give me a big hug. Love his "Sam sayings" and his not so perfect writing and his simple littleness. Day three: Saturday, family birthday party. Yes, another party. Sam would be happy to have a party every day but this was the last party to celebrate his year of 6. 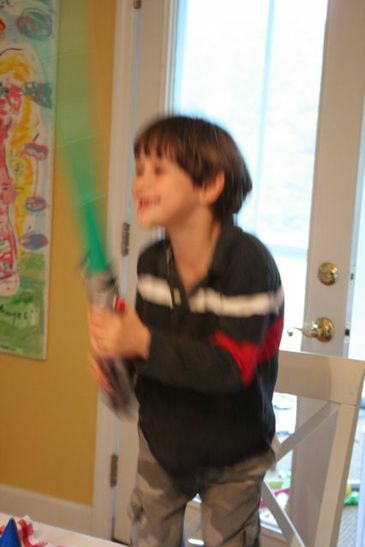 I think this photo of him is perfect because it describes him pretty well.... constant motion, smile on face , with green light saber. 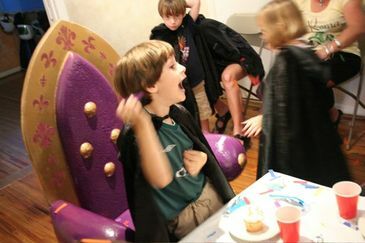 This photo is taken right before the birthday cupcake wish and presents.... so there is one exuberant 6 year old. The days have flashed by with all the ceremonies, parties and celebrating. How priceless these photos really are. They speak volumes. They describe in picture this little boy who is on the edge of "real school" and growing day by day, hour by hour. Dear Sam, we love you.